Because inpatient facility claims and individual provider or clinic claims are so different from each other, they're each billed on different claim forms. Individual provider claims are billed on the CMS 1500 form. All hospital (or institutional) claims are billed on the UB 04 claim form. 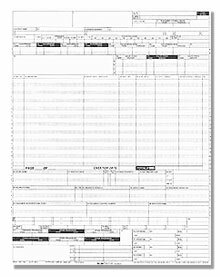 Like the CMS 1500 claim form, an inpatient hospital coder fills out the UB04 form with the procedures and charges from the patient visit. Then the form is sent to the patient's medical insurance. Once the insurance receives the form, they review the charges, determine the patient's benefits, and pay out according to the negotiated rates. Click for a tutorial on the CMS 1500 claim form. Unlike the CMS 1500 claim form, however, the UB-04 form includes a much more complicated set of boxes. These specify the types of services provided during the patient's hospital stay. They need to be filled out accurately to make sure that the claim is paid correctly the first time it gets sent. But how do you fill one out correctly? The top of the form includes an area for the provider information, including federal tax identification number. There's also a space for the patient's medical record number, which is assigned to the patient by the provider's office. Underneath this section, there's a small section on patient identifying information, and a section with boxes for occurrence dates and condition codes. These are a necessary part of hospital billing, because many people who are admitted and treated in the hospital have complicated, life-threatening conditions. The more information provided to the patient's insurance the better. This includes facts like when the first occurrence started, whether it was recurring or onset, or whether or not it was related to an accident. Underneath the patient condition and occurrence date span boxes is a large section where you can describe what procedures were performed on the patient, and a large section in which to include HCPCS Level II codes. Because hospitals provide many different types of services for patients, including supplies, transportation, and medicine, they bill for many more HCPCS codes than individual providers. The UB-04 claim form has a large section where you can include all the necessary HCPCS codes, including a section in which you can indicate how many pages of codes are included in the claim. Underneath that there's also a large section where you can include up to 18 diagnosis codes. This is necessary because a patient may have many different presenting problems in the inpatient setting, especially during surgery or following a serious illness or emergency. And finally, under the diagnosis section is a space for additional procedures and remarks. To the right of this is another section where you can refer to individual providers, including attending and operating doctors. The UB 04 form is very different from the CMS 1500 medical claim form. This is because while hospitals don't generally charge for patient procedures, doctors do. When a doctor performs a procedure at a hospital, they'll bill their services individually to the patient's insurance, using the CMS 1500 claim form. The hospital in which the patient was seen, however, will also need to be reimbursed by the patient's insurance for the services they provided during the course of the patient's care. This is why the UB 04 claim form has such a large space for HCPCS codes. The institutional provider claim (UB-04) is specially designed to allow more room for HCPCS codes, rather than CPT codes. This is because they're the majority of the services provided at the office visit. Hospital coding is very different from regular provider coding. Although ICD-9 (diagnosis) codes remain the same no matter what, you may use a number of different sets of procedure codes depending on the type of facility setting. Understanding the differences between the CMS 1500 and UB-04 claim forms is an essential part of being a successful hospital medical biller and coder. See this article for more information on hospital billing software. Also see our step-by-step guide to filling out the CMS 1450.